Anna van der Breggen has taken the rainbow jersey at the World Championships and that victory adds to the silver medals she got at the individual and the team time trials in Innsbruck. The Dutchwoman knew that the route was good for her skills and has been preparing for this for the entire season, which made the win an emotional one. "That's because of the long build-up to this event, it's quite a stressful preparation ahead of the world championships," she commented. "I knew this was the perfect course for me, but it was such a long wait to get here. This morning, I didn't want to see anyone and thought: just let us get on the bikes. This was a big goal for me and it wasn't a secret, so there was a lot coming at me. I didn't expect to win like this." Australia's Amanda Spratt was at the front group when Van der Breggen decided to make a decisive move from the peloton. "Spratt was off the front and we knew we couldn't give her too much space," the rider explained. "Lucinda (Brand) therefore tried to keep the gap to a minimum but attacking and later just pulling at the front. Then Annemiek (van Vleuten) opened with an attack. We couldn't wait any longer. That was the beginning, I attacked after that. "I thought it was early to go, but I reached Spratt quite quickly. Then I was by myself early on, so I just had to focus on eating and drinking well and pacing. I knew I had to do that climb again by myself. I also had barely any info on what the time gap was, how far I was off the front." 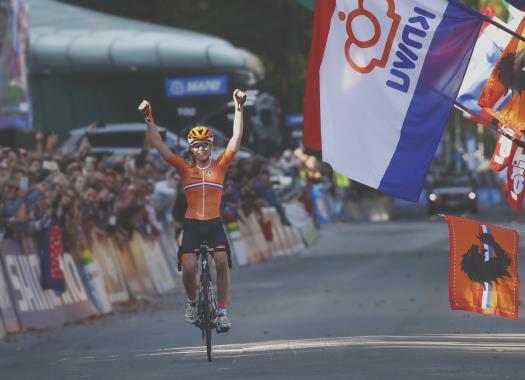 At the 2018 European Championships, Van der Breggen launched a late attack and was caught by a reduced peloton in the last kilometres, this time she didn't want that to happen again. "At one point, I knew that my advantage hovered around two minutes on the climb, but I have experienced way too often this season that either I did something wrong or that I was caught back. So I just kept on riding."